Slow Cooker Standards: Mom's Seven Layer Dinner. 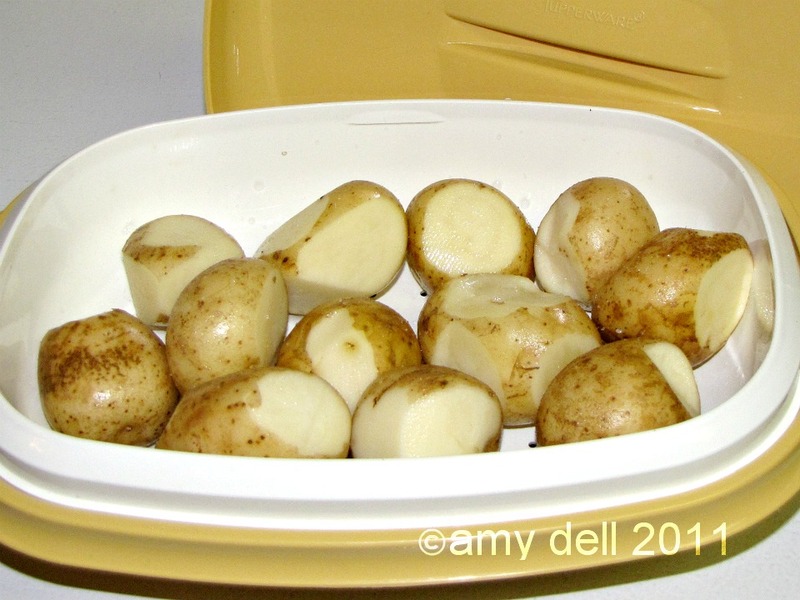 Steam potatoes whole, in the microwave steamer for 5 minutes (optional, sprinkle with a little salt). 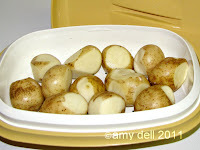 Then slice them as though I were going to make scalloped potatoes. Fry the ground beef until it just begins to turn brown. Mix the tomato soup, water, seasonings, and ketchup in a separate bowl-stir well. 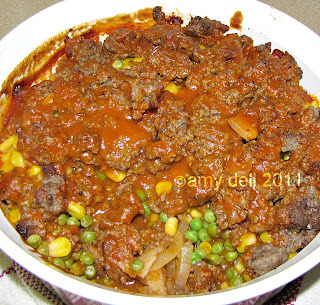 Spray your slow cooker, or 2.5 L casserole dish with non-stick cooking spray. Place the sliced potatoes in the bottom of your dish. Sprinkle the Minute Rice over the potatoes. Spread onions over the rice. Pour half of the Tomato Soup mixture over these layers. Put frozen vegetables on next. Pour remaining Tomato Soup mixture over the whole dish. Slow Cooker Method: Cover and cook on High for 4 hours, Low for 6-7 hours. Oven Method: Cover and bake in a 350 F oven for 1 hour 30 minutes. Mom has used cabbage, carrots, and/or turnip. These would be par-boiled for 10 minutes or steamed for 5 minutes before slicing and layering into the dish. You can change the middle layers up, but the potatoes and rice always go on the bottom because they need the direct heat. Also, the sauce will pool at the bottom and cook the rice. We always put the meat on top because it gets a nice crispy texture. Try lean ground turkey, chicken, or even veggie "meatless" crumble instead of ground beef. Use 4 cups of Salsa instead of canned tomato soup+water.